So far, Holly Willoughby has launched two collections for Marks & Spencer, and each one has gone on to be a huge, sell-out success. And now, the very first piece to drop from her third ‘Must-Have’ range is proving to be no exception! Ahead of the collection’s official launch next week, M&S have released Holly Willoughby’s newest animal print midi dress a week early, for eager fans who are desperate to get their hands on it. The retailer teased the dress’s launch last week, and had customers going crazy wanting to know when they can buy it. And now that’s it’s officially been released on the website, it seems the enthusiasm hasn’t waned, with the dress selling out fast! 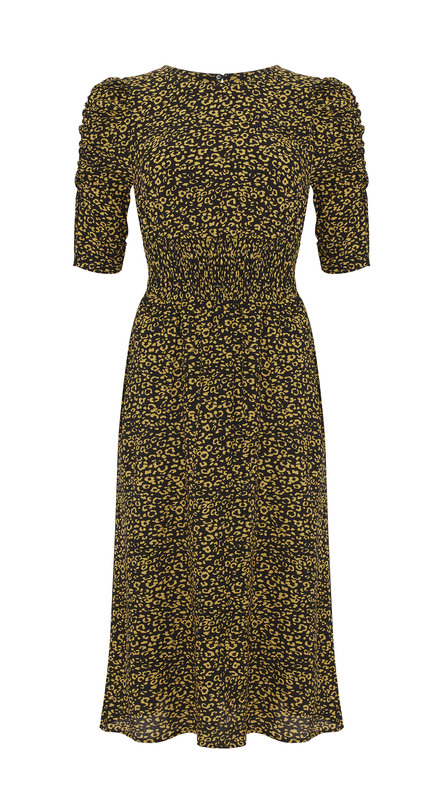 The black and yellow midi dress, designed in the same style as a few other dresses from M&S, is on sale in three different lengths, short, regular and long. But it’s already sold out in multiple sizes across the three of the lengths. While there are only three sizes left in the short style, in 14, 20, and 22, most sizes are available in the regular length, and sizes 6 through to 14 are still on offer in the long length – ideal for taller women. Luckily for fans, the dress is also super-affordable as well as brilliantly fashion-forward. It’s on sale for £39.50, meaning it won’t break the bank so close to Christmas. It’s also on sale in a mini-me version, for young girls who fancy mimicking Holly’s style. With such a chic, affordable buy, it’s no surprise that customers are snapping it up in a flash. In fact, the dress already has over 50 positive reviews, despite only being released a day ago. One happy shopper wrote on the M&S website, ‘So flattering and most importantly comfortable! !’, while another agreed saying, ‘A really comfortable but smart, up to date, dress. I am really pleased with it especially as it came in a choice of lengths’. A third customer also wrote, ‘Lovely dress, material good quality, true to size, the colours are lovely. Very impressed’. And a fourth said, ‘I am so glad I decided to try this particular one as it fits really well, is very flattering and most importantly of all it has pockets.’ High praise indeed! Holly’s latest ‘Must-Have’ dress is without doubt an ideal pick for the winter months. With its elbow-length sleeves and long, midi style, it’ll keep you covered up and warm as the temperature continues to drop, as well as making sure you look polished and put together. While Holly paired hers with tights, you could always wear yours with just a stylish pair of boots – if you’re feeling brave enough! Layer it up with an edgy leather jacket for a really chic look.